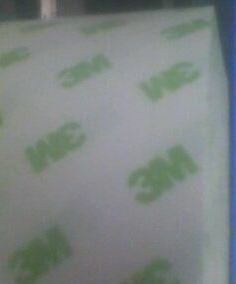 3M™ #9183(non-woven DCT) is a high tensile strength non woven tape coated on both side with a high adhesion acrylic pressure sensitive adhesive. This tape is protected by a polycoated white paper release liner. Due to the high tensile non woven, this tape can be removed without adhesive residue after long term aging. It features dimensional stability and improved handling with ease of die cutting and laminating because of non-woven with high tensile strength. 3M™ High Performance Acrylic Adhesive provides high bond strength to most surfaces. • This tape can be removed without residue after long term aging because of the high tensile non woven. • This tape is suitable for recycle parts use, because of its high removable property. • This tape has a non-woven carrier with high tensile strength which can add dimensional stability and also makes it easier to handle the tape during punching use and die-cutting.